There are some malts you hear about, often claiming many grand things that sometimes it becomes hard to believe any of them as true. 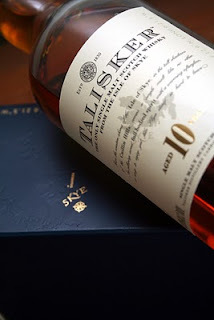 The Talisker 10yo is a seriously grand single malt deserving of it's reputation. Our club is named after the Talisker 20yo, and though I have never had it, I dare say the Talisker 10yo is not far off the mark. Colour: is a dark rich caramel. Nose: immediately one gets salty, fresh seaweed, with a medium smokey peat. I find it is certainly abrupt and may in fact put a few off that have never had it before because it is so different to most of the other standard release Scotch whisky's here in Australia. Taste: one gets gets sweet and salty at the same time which plays really well on the senses. After the initial taste one may get iodine, mild peat, earthy spice, and a tickle of alcohol. For all the extremes it is a really amazing balance. Finish: certainly warming and grows with intensity over several minutes. It is almost as though it moves down to the stomach before proceeding back up with doubled intensity to a warming blaze. A very interesting experience. Value: at the moment is great and a bottle can easily be picked up for A$75. If I was to give a dram I would certainly give it a 6 1/2 out of 7. I would award the extra half-point but I really want to taste the Talisker 18yo (and other family members), so I have to leave at least one step on the ladder to climb. Highly recommend not just for the taste but also the experience. As a side note following up on the blind tasting comment above it is quite possible that the first time tasting the Talisker 10yo simply lacked focus. It was a busy night with a degree of consumption of cheesy corn chips (or something similar) before hand that probably just totally masked the flavour. I remember liking it but no where near as much as on the 2nd time round at the blind tasting. What had I been eating prior to this blind tasting you may ask? A heavy stew with lot's of earthy flavours, memorably salted and deep texture. Could this have been an influence? Maybe so I am keen to continue experimenting with food and whisky. Keep it away from the pesky single malt seagulls, as a well salted Talisker will certainly dram their attention.